If you haven’t danced to Lil Pump in Alabama or worked out to 6ix9ine in New York, have you even lived? If you’re listening to music on your phone, chances are you’ve downloaded Spotify. 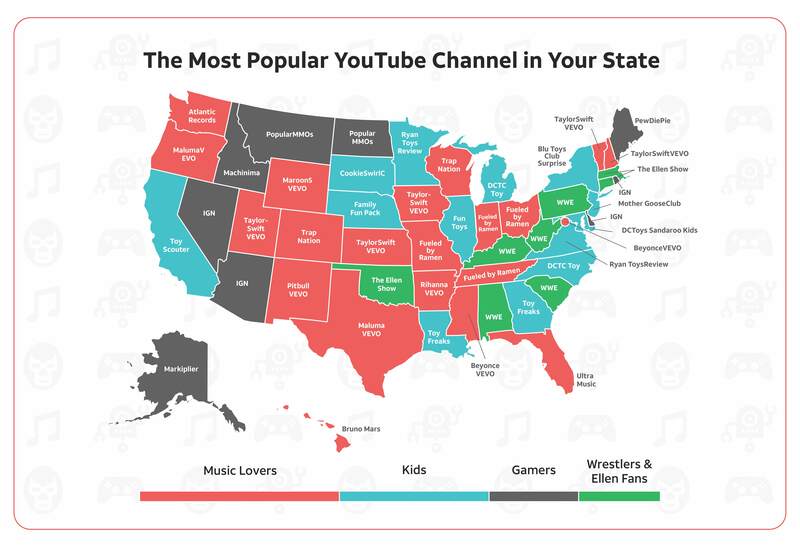 There are millions of artists on Spotify and a number of genres to choose from, but we at All Home Connections decided to see which one your state can’t get enough of. How’d we do it? We used Spotify’s US “Top 200” chart, then analyzed each artist’s search rank and cross-referenced it with Google trends to determine the 27 most popular artists in the country. Interested to know what your state is listening to? Grab your dancing shoes or get ready to hunker down and cry, because you’re about to find out. Pop and Dance Pop are the clear favorites in the majority of states. Ed Sheeran’s “Shape of You” came in on top, having been streamed more than 1.7 billion times. At $0.0038 per stream, Ed has made upwards of $6.6 million on that song alone. In 6 of the 9 states that prefer Demi Lovato, there happens to be a higher-than-average female/male ratio (girl power for the win). Artists like Charlie Puth, Demi Lovato, Hailee Steinfeld, and Taylor Swift are made popular mostly by teens and preteens, and are all connected to states that have a population of 0-18 year olds above the national average. If you’ve never heard A$AP Ferg, Kendrick Lamar, or Young Thug, you’re probably not a HipHop fan (and if you want to be, now’s a good time to look them up). 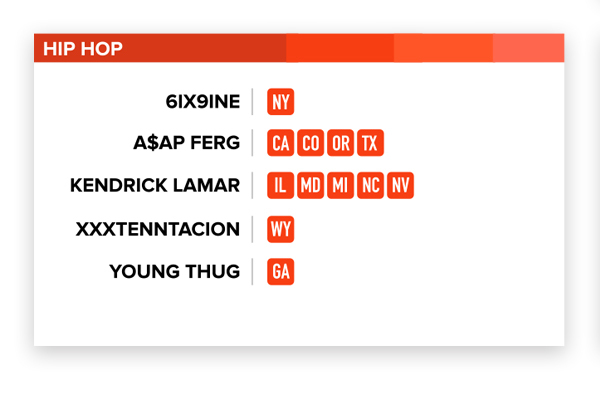 Anyone wanting to get down and dance should join New Yorkers and tune into 6ix9ine, rated the most energetic artist according to Spotify’s internal classification algorithm. Wyoming surprised us with their love of Hip Hop—despite stereotypes and the fact that they have more country radio stations than any other genre. 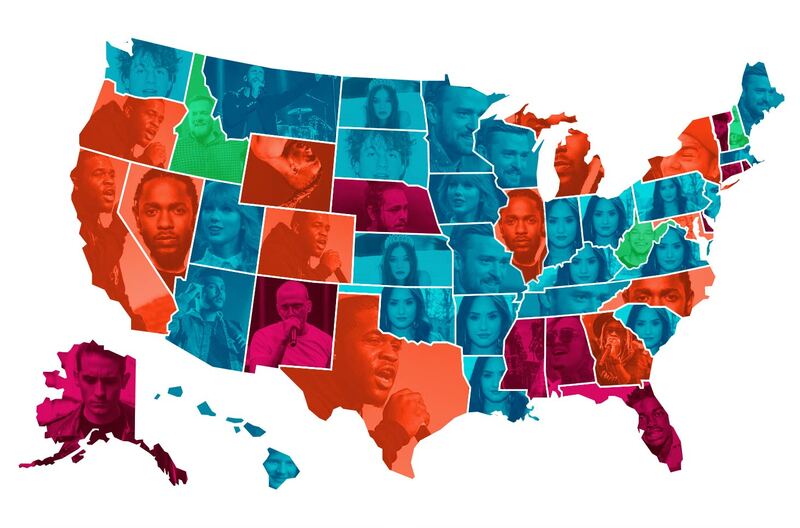 When it comes to Rap-lovers, the East Coast is where it’s at. We’re talking Kodak Black, G-Eazy, and Post Malone (whose 2018 success is breaking records)—favorited everywhere from Florida to Delaware. 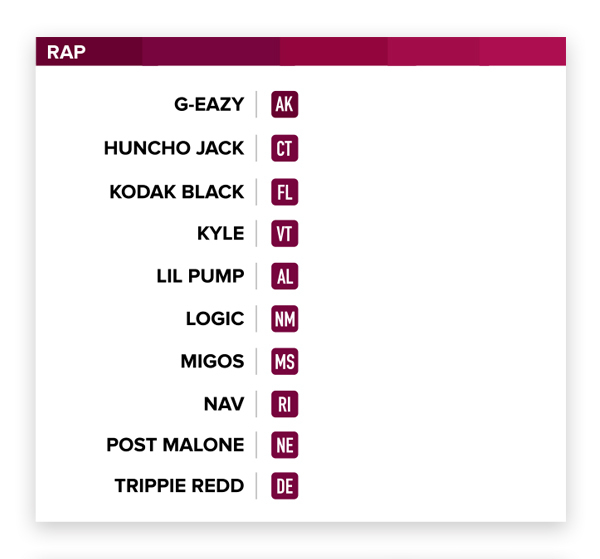 According to Spotify data, Logic takes the cake for the longest songs, Lil Pump for the most danceable, KYLE for the slowest tempo, and Huncho Jack for the happiest (weird, but true). The remaining three states are the outliers. 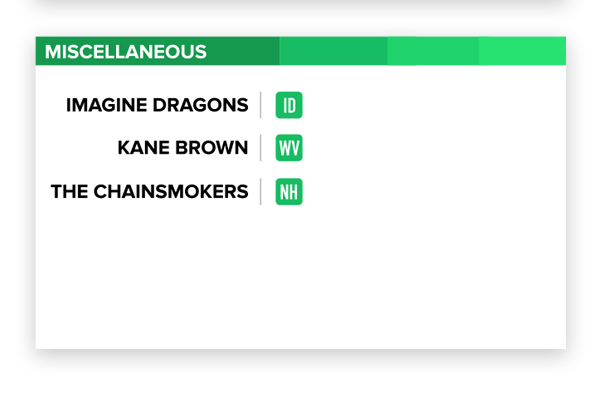 West Virginia is the only state who prefers country music, New Hampshire is the only Chainsmokers (EDM) fan, and Idaho the one state who favors Imagine Dragons. West Virginians march to the beat of their own drum (or banjo), so if anyone is going to love Kane Brown, it’s them. As to New Hampshire—we now have someone to blame for the excessive Chainsmoker radio appearance. The whole country was jamming to “Closer” in 2016, but New Hampshire still refuses to let it go two years later. 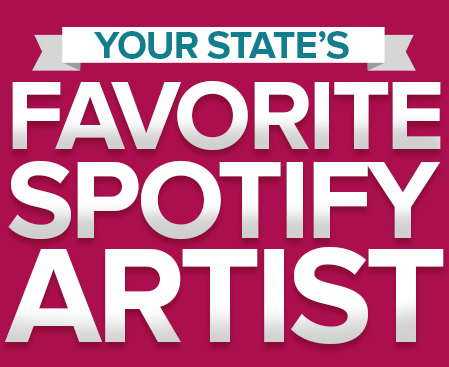 Is your state’s favorite artist on your Spotify playlist?